SEOUL, Nov. 7 (Yonhap) — South Korean officials remained relatively optimistic Wednesday about denuclearization talks between North Korea and the United States in spite of the expected cancellation of their New York meeting this week. They were informed in advance of the decision, the presidential office said, apparently trying to demonstrate a close coordination between the allies on the North Korea issue. “I don’t think the North Korea-U.S. talks have been cancelled or dialogue has lost steam even if (the New York meeting) was put off,” Cheong Wa Dae spokesman Kim Eui-kyeom said at a press briefing. He cited “various channels of communication” between the allies, including phone conversation between Stephen Biegun, Washington’s special representative for North Korea, and his South Korean counterpart Lee Do-hoon. 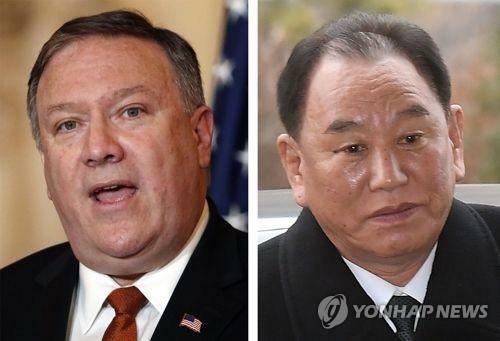 Secretary of State Mike Pompeo was scheduled to meet with Kim Yong-chol, a top aide to the North’s leader Kim Jong-un, on Thursday. In the surprise statement that came shortly after the U.S. midterm elections, however, the State Department announced it will take place at a later date. She gave no other details, including the reason for the cancellation and a new candidate schedule. The North kept mum on the issue. It was uncertain whether the North offered the postponement. A senior foreign ministry official here pointed out the New York session, if held, was expected to move forward efforts for denuclearization and lasting peace in Korea. “Regrettably, it did not happen,” the official told reporters on the condition of anonymity. He asked them not to attach “excessive meaning” to the delay in the talks, saying it’s just part of a long process. He stressed that the U.S. made the announcement in a “calm” statement, which suggests no serious problem in rescheduling the high-level talks. If Pyongyang had given a unilateral notification to cancel negotiations, Washington’s tone would have been stronger, he added. There’s a possibility that they will have working-level contact first between Biegun and the North’s Vice Foreign Minister Choe Son-hui. Otherwise, a prolonged lack of formal dialogue may affect the schedule for the North Korean leader’s reciprocal visit to Seoul and the pace of inter-Korean cooperation. South Korea is pushing for the re-connection of cross-border railways and remodeling of a family reunion center at the North’s Mount Keumgang. The U.S. has demanded that such projects, potentially related to sanctions on Pyongyang, should proceed together with progress in denuclearization. South Korea also expects the North’s leader to make a visit here amid progress in Pyongyang-Washington talks before the end of this year. President Donald Trump canceled his summit with the North’s leader in the spring but rescheduled it later. They met in Singapore in June. Trump’s national security adviser John Bolton said their second summit is expected to be held early next year.